Five nights at Freddy’s is a horror indie game where you play as a night guard called Mike Schmidt in a place called Freddy Fazbear Pizzeria you must survive the night from 12am to 6am for five nights with each night getting progressively more difficult. 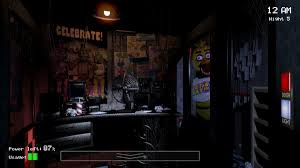 At the end of Night five which would be Friday Mike gets paid £120 because you in the game mike gets paid £4 an hour for each Night after Night Five there are two bonus nights with Night seven being a custom night which when you complete it Mike gets fired for Tampering with the Animatronics referencing Night Seven being the Custom Night. When you are actually playing This game you are placed into a security room you cannot walk around the Pizzeria Inside the security room there are two buttons on each side which have a door on either side one closes the door while the other turns on a light so you can see down the corridors to see if anything is coming. 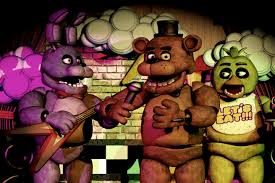 To survive the night you have to make sure you don’t get caught by the four Animatronics Bonnie the bunny, Freddy Fazbear, Chica the chicken and Foxy the pirate. the reason the Animatronics are coming after you is because at night they are left on a free roaming mode meaning they can walk about freely around the Pizzeria if they wasn’t allowed to do this there servos would lock up. 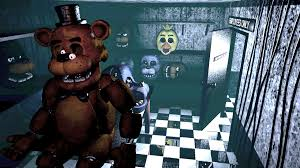 Due to it being night time the Animatronics no longer read you as a human and more of a Endoskeleton and one of the places rules is that all Endoskeletons should be in a suit if they find you they will drag you off to the backstage and literally stuff Mike inside a Freddy Fazbear suit which would kill him because all of his bones would of been crushed and all the electronics would of killed him if you lose the game you see this as the game over screen shows Mike stuffed inside of a suit blood coming from the suits mouth and his eyeballs coming from the suits eye holes as shown by this image. 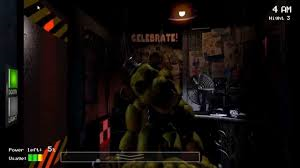 To survive the night you must make sure if you see Bonnie which appears randomly at the left door or Chica who appears randomly at the right window you should immediately close the door this also works the same with all the Animatronics if you cant close the door put your camera up then down and you will be killed by any of the animatronics because they jam the door open. with Foxy however the only way you will know if he’s coming is that you will see him peer from the curtain but if the curtains are fully open at pirate cove you have a split second to close the left door or he will kill you he is the only Animatronic that runs at you can see him running down the left corridor by putting the camera on the left corridor. Another thing you will face is that you are on limited power which is displayed on the bottom left screen each action you do such as closing the door, checking the cameras and turning on the lights uses power it is constantly draining due to the fan and light in the security room constantly being on you can not turn these off if the power reaches 0% the whole place will go dark and if you look left you will see Freddy and his song toreador will play you can keep this song going longer by making Mike remain still giving you more of a chance to make it to 6am due to Freddy will not kill you while his song is playing. While playing there is a chance to spawn golden Freddy the only way to do this is that the poster in the left corridor corner will sometimes change to a close-up of golden Freddy if you put the camera down when you see this he will appear in the security room even if the doors are closed he is always slouched and you have a few seconds to react the way to get rid of him is by bringing the cameras back up again if he kills you instead of going to the game over screen it instead will crash your game the same happens if you put the A.I levels on the custom night as 1987 it will cause golden Freddy to immediately appear and kill you thus crashing the game nobody knows if golden Freddy is an actual Animatronic in the game like the earlier version of Freddy or if Mike is hallucinating him. There are Two versions of this game the demo version which only covers Two nights out of Five (Seven if you count the bonus Nights) the demo version is exactly like the full version. the full version costs roughly £1.00 to £2.00 and it covers all Seven Nights a second Five Nights at Freddy’s is currently being made and should come out some time in 2015. The animatronics look like this from left to right Bonnie, Freddy and Chica the next image to the right is what Foxy looks like. “Hello, hello? Uh, I wanted to record a message for you to help you get settled in on your first night. Um, I actually worked in that office before you. I’m finishing up my last week now, as a matter of fact. So, I know it can be a bit overwhelming, but I’m here to tell you there’s nothing to worry about. Uh, you’ll do fine. So, let’s just focus on getting you through your first week. Okay? Blah blah blah, now that might sound bad, I know, but there’s really nothing to worry about. Uh, the animatronic characters here do get a bit quirky at night, but do I blame them? No. If I were forced to sing those same stupid songs for twenty years and I never got a bath? I’d probably be a bit irritable at night too. So, remember, these characters hold a special place in the hearts of children and we need to show them a little respect, right? Okay. So, just be aware, the characters do tend to wander a bit. Uh, they’re left in some kind of free roaming mode at night. Uh… Something about their servos locking up if they get turned off for too long. Uh, they used to be allowed to walk around during the day too. But then there was The Bite of ’87. Yeah. I-It’s amazing that the human body can live without the frontal lobe, you know? Uh, now concerning your safety, the only real risk to you as a night watchmen here, if any, is the fact that these characters, uh, if they happen to see you after hours probably won’t recognize you as a person. They’ll p-most likely see you as a metal endoskeleton without its costume on. Now since that’s against the rules here at Freddy Fazbear’s Pizza, they’ll probably try to… forcefully stuff you inside a Freddy Fazbear suit. Um, now, that wouldn’t be so bad if the suits themselves weren’t filled with crossbeams, wires, and animatronic devices especially around the facial area. So, you could imagine how having your head forcefully pressed inside one of those could cause a bit of discomfort… and death. Uh, the only parts of you that would likely see the light of day again would be your eyeballs and teeth when they pop out the front of the mask, heh. “Uh, hello? Hello? Uh, well, if you’re hearing this then you made it to day two, uh, congrats! Uh, I-I won’t talk quite as long this time since Freddy and his friends tend to become more active as the week progresses. Uhh, it might be a good idea to peek at those cameras while I talk just to make sure everyone’s in their proper place, you know. “Hello, hello? Hey you’re doing great! Uh, most people don’t last this long. I mean, you know, they usually move on to other things by now. Uh, I’m not implying that they died. Th-th-that’s not what I meant. Uh, anyway, I-I better not take up too much of your time. Uh, things start getting real tonight. Uh, h-hey, listen, I had an idea: if you happen to get caught and want to avoid getting stuffed into a Freddy suit, uh, try playing dead! You know, go limp. Then there’s a chance that, uh, maybe they’ll think you’re an empty costume instead. Then again if they think you’re an empty costume, they might try to stuff a metal skeleton into you. I wonder how that would work. Y- Yeah, never mind, scratch that. I-It’s best just not to get caught. “Hello, hello? Hey! Hey, wow, day 4. I knew you could do it. Uh, hey, listen, I may not be around to send you a message tomorrow. *banging sound* It’s-It’s been a bad night here for me. Um, I-I’m kinda glad that I recorded my messages for you *clears throat* uh, when I did. Uh, hey, do me a favour. *bang bang* Maybe sometime, uh, you could check inside those suits in the back room? *bang bang* I’m gonna to try to hold out until someone checks. Maybe it won’t be so bad. *bang bang* Uh, I-I-I-I always wondered what was in all those empty heads back there. *chime plays*. “(Omitted: Sir,) it is lamentable that mass agricultural development is (omitted: not) speeded by fuller use of your marvelous mechanisms. Would it not be easily possible to employ some of them in quick laboratory experiments to indicate the influence of various types of fertilizers on plant growth? there is lore in this game set before the starting point of where you play but it is hidden on one of the walls the rules of the Pizzeria will sometimes change to that of newspaper clippings telling you the past of the place in it tells you that there was a killer who dressed up as Freddy Fazbear and lured Five kids to the backstage and killed them he then stuffed them inside each of the Animatronic suits. later on Foxy bites a kids frontal lobe out at the year 1987 that is why he is behind pirate cove curtain and a sign that says sorry out of order is in front of it his body is also destroyed in parts.